These countries offer generous benefits for parents, making it easier for working mothers and fathers to balance work and family. Consistently ranked the top country for gender equality, Iceland has one of the highest rates of working moms of any developed country. Among mothers with children under age 15, about 85% have a job. 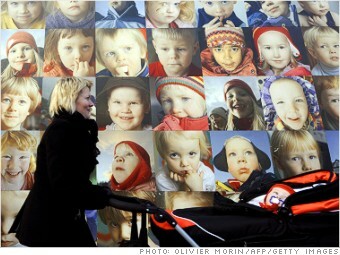 Iceland has had a paternity leave policy since the 1970s, and last year, passed a new law known as the 5-2-5 policy. It entitles the mother to five months leave, the father to five months leave, and an additional two months leave that parents can divide among themselves as they like. Parents have up to two years to use the time-off, during which they are paid 80% of their previous wages. Once children hit age three, nearly all Icelandic tots head to pre-school, as opposed to daycare centers or home-based care. For low income families, it's free. Source: We used data from the Central Intelligence Agency and the Organisation for Economic Co-operation to compare female employment rates, length of work weeks and fertility rates, and then looked at parental leave policies by country.